A Guinea Pig Zero Web Exclusive! Scientists have a history of using children, soldiers, prisoners, and the poor as medical subjects for experimentation. But this is the story of a man taking medicine into his own hands. Clint Hallam has profited himself as an entrepreneurial guinea pig, instead of being paraded through the freak shows by doctors getting all the money and recognition. Everyone knows the drill: listen to the droning of the saw, hear the scream, see the blood, grab the finger, grab your friend, jump in the car and get to the hospital ASAP. If you're lucky, two hands of five fingers will remain....Yes, exciting things are going on in the world of medicine every day. 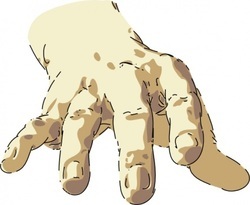 Since the last forty years or so, the technology has been available for doctors to reattach missing digits and limbs. But only in the past three years has this technology been stretched to allow for the transplantation of somebody else's hand onto the stump! Now, I don't know about you, but I personally don't think I would want to be the guinea pig for such an experiment. It entails a life of daily immunosuppressants (to stop your body from rejecting the foreign body part) and tons of physiotherapy to enable, hopefully, the new limb to move someday....somewhat. Well, about three years ago, Clint Hallam, a one-handed New Zealander, and Dr. Earl Owen made first contact. Now in his 60s, Dr. Earl Owen was one of the few who helped form the modern assumption that if part of you gets chopped off, bring it to the hospital and they will fix it. Since 1970, Owen has been sewing on severed limbs and fingers. Although the operation is tricky, it is often successful. One of the hardest parts of the operation is the rejoining of the nerves; no thicker than hairs, they are worked on under a microscope. Without the nerves, we would be dealing with just a paralyzed appendage. Two examples of Owen's handiwork: a man had his hand twisted off in a lathe, but since his operation has gone back to work as a garage mechanic. A second is working again as a carpenter after losing his hand in a concrete mixer (the hand had to be actually extracted from a solidified block of concrete). Both of these operations used the person's own hand; the use of a foreign hand however, is much more difficult. The advent of this new medical age is due to the advancement, in the 1990s, of a new suite of immunosuppressant drugs which were strong enough to restrain the human immune system without killing the patient. In 1984, Clint Hallam lost his hand in a circular-saw accident at Rolleston prison, near Christchurch, New Zealand where he was serving a two year sentence for fraud. His own severed hand had been sewn on after the accident but, never having taken properly, five years later he decided to have it amputated to clear the site for a "new and better hand." Clint explained to a French journalist how he had become obsessed with getting a transplant and that he had faxed and called everywhere, trying to find the capable doctors that he needed. This is how he found Earl Owen. As they both shared a mutual goal, the scene was set for the world's first successful hand transplant. The medical team included experts in microsurgery, orthopedics (medicine of spines and joints), and transplant surgery. Led by Earl Owen of Sydney, Australia and Jean-Michel Dubernard of Lyon, they were joined by Briton Nadey Hakim, Italian Marco Lanzetta, Australian Hari Kapila, and Frenchmen Guillaume Herzberg and Marwan Dawahra. On September 23, 1998, following a thirteen hour operation in Lyon, France, the first successful hand transplant in decades was accomplished. (The only other known hand transplant was in Ecuador in the 1960s; the patient's body rejected the hand after only 2 weeks). The doctors used the same technique as for re-attaching a patient's own limb. Clint's complex operation required the setting of two bones in the arm, followed by painstaking attachments of a half-dozen blood vessels and nerves and nearly two dozen tendons that control movement of the wrist, fingers and thumb. Plastic surgery was required to combine muscle and to stitch together the several layers of skin. The donor was a motorcycle accident victim whose brain had been irreparably damaged. His arm was cut off, chilled and whisked to the hospital in Lyon. The 48 hours following an operation are important to ensure that there are no blood clots which could cut off blood circulation to the hand (they don't want to sew on a dead hand!). Success in the month after is critical in determining whether the transplant will survive or be rejected by the body's immune system. The doctors thought that if the hand did survive, it would be 12-18 months before Hallam regained sensation and control. They expected him to be able to grasp with his hand but were less confident of his regaining fine movements of fingers. After the operation, a patient must take immunosuppressants every day for the rest of her or his life, so that the body doesn't reject the hand. The risks of the immunosuppressants include: high blood pressure, liver and kidney dysfunction, increased risk for certain cancers, diabetes (which Clint got), and death. After his operation, Clint Hallam was supposed to rest in France under medical supervision, reporting daily to rehab, and then return to Australia around December, 1998. Instead, a few weeks after the operation, Clint headed off to the US to hit the chat shows, then traveled to London. It was not until March 1999, six months after his operation, that he finally returned to Australia. He was supposed to have arrived in January, not only for medical maintenance, but also for a court date for fraud-related charges involving a marketing investment scam worth around $620,000. One time when Clint was having problems at the border due to a missing passport, he lied, saying he had forgotten to renew it. In fact, it was because he was forced to surrender it while under investigation into his alleged involvement in a fuel racket. The charges stemmed from using bogus credit cards to buy fuel in Australia. He was also now barred from doing business in New Zealand. Right before the warrant was issued, he fled, leaving behind his second wife and two kids. About eighteen months after his operation, Clint returned to France for his check-up (rehab and treatments). There, Hallam met Thierry Decotignies, a French liver transplant patient, who befriended and helped him in the hospital. On his way out of the hospital, Hallam stole Thierry`s credit card and subsequently racked up some tens of thousand dollars worth of purchases. Cash from the hospital's transplant fund had also been stolen. In October 2000, when Hallam returned to France for his test, he was nabbed by the police in a hotel in Lyon. After being caught, he was allowed to leave France, but only after giving back some of the money. Medically speaking, the first year with his new hand was successful; he had gained some use of his hand. But afterward, there were pockets of rejections. It is difficult to know exactly why this happened, as there are many discrepancies in the stories. The doctors were far from amused when they discovered the real reason for Clint's missing hand. He had told them it was lost in a construction accident, not in jail. Hallam's fabrications, along with frustration and anger of the doctors at not having the docile and obedient guinea pig they were hoping for, makes it a little difficult to get a clear, unbiased story. About a year ago, Clint had gone for treatment for rejection at a West Australian hospital. He complained that his hand wasn't working properly, he wanted it off. He had never got used to it, he said, and was mentally detached from it. He begged the doctors to remove it, but the French doctor who had co-led the operating team, said "no"on grounds that the body is inviolable under French law. He wasn't just taking revenge against a disobedient guinea pig, I hope, treating him as an experiment, not as a person. The hand had become unsightly, dry and scabby, so he often kept it hidden. One hand did not even match the other: the new hand was wider and longer than the other, with flesh of a different color and flaky skin. The rejection of his hand, he says, started while he was still under strict medical surveillance. He did give up his medications several months later, so he could get over the flu. He was sure that there were drugs to make his hand look better but not necessarily to help it be functional again. Owen and the doctors argue that Hallam went nearly 2 1/2 years without immunosuppressants and no physiotherapy. At one point, Dr. Hakim had begged him to take the medication and go to a university in Chicago where someone would pay to do experiments on him (but he seemed to have his own way of making money). On these grounds, they blame the rejection on Clint. In their version, three months after the surgery, January 1999, Clint disappeared for over 2 months (he was off making cash on the US talk shows) and that he "voluntarily went without drugs for weeks at a time and didn't follow the plan he had agreed to." This frustrated their attempts to treat him optimally, bringing on the irreversible rejection that necessitated amputation at the risk to his health (although keeping it could certainly be construed as a risk to his health as well). But, the saga does end, February 3, 2001. 28 months after the transplant, at Clint's request, surgeons in Britain amputated the hand. In a private hospital in London, Dr. Nadey Hakim, 42, amputated the same hand his team had helped to attach. After sixty days of no immunosuprressants, the hand was dead, and septicaemia was not far away. Hakim commented, somewhat optimistically, that since the first heart and kidney transplants lasted only ten days, 2 1/2 years wasn't so bad. The only other person to make positive comments on the whole affair was Dr. Burloux, a psychiatrist. Although Clint hadn't been taking his medication, he was the right person at the right time. He let them learn lots, opening the door to new technology and giving a service to science. Dr. Burloux suggests reserving the operation for people needing double hand surgery, where it is really necessary. We should thank Clint, as we would not have known before the true mental adjustments it takes to have another person's hand sewn on. There is already a large number of people sending letters to Owen and others, asking for help, wanting their hands back. The patient selection process may become even more strict after this incident, and sadly, limit the recipients to more "upstanding citizens"; instead of solely those in need, who may not take their medication and waste a valuable organ. Since Clint Hallam's operation, there have been five single and two double hand transplants (one just 2 weeks after the amputation). Both double hands were in the US (an explosives worker and a house painter, father of two), for the singles: two in China, two in the US, and one in Austria (a policeman). This `treatment` is here to stay. Please, don't take it for granted, be careful with your hands!